The holiday season is traditionally a time of year when people add four-legged friends to their families. Children aren’t at school and adults are on leave from work making it convenient to adopt a pet, however, The Lost Dogs’ Home urges families to think about pets beyond the holidays. “Many people decide to adopt at this time of year, but I would encourage families to think beyond the Christmas period to what lifestyle commitments may be on the horizon for the entire family,” said Sue Conroy. Dogs are at least a ten year commitment and cats are at least twelve years, costing owners upwards of $1,000 per year, and that’s if no major veterinary issues occur. “Families should think about veterinary costs, the daily commitment to training and exercising pets and boarding fees when families go on holidays”. The Lost Dogs’ Home receives a peak in surrenders and abandoned pets around May. Some of these admissions can be attributed to families who have not properly thought through the decision to purchase a kitten or puppy at Christmas time. “Five months after Christmas, cute kittens and puppies are delinquent ‘teenagers’ requiring obedience training, socialisation, exercise and care,” said Ms Conroy. “This becomes all too hard for some families who haven’t thought through this commitment. Dogs and cats can live for eighteen years – some marriages don’t last that long, people change jobs and some move overseas. New pet owners should be sure they can include their pets in their intended activities and lifestyle changes”. 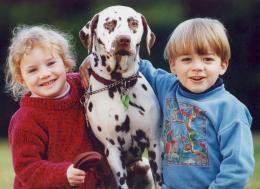 Emily and Ryan were just five when they adopted Ruby from The Lost Dogs’ Home. They are now approaching fifteen. Please remember, a pet is for life…not just for Christmas. If you are ready to make the commitment to a pet, please view our dogs and cats available for adoption.